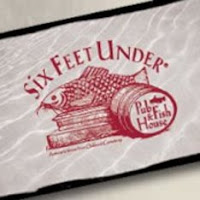 The Sullivans: Sweetwater, El Taco, and Six Feet Under! Sweetwater, El Taco, and Six Feet Under! We went to Six Feet Under for the Oyster Roast on Sunday! El Taco in the Highlands on Saturday night! Hanging out at the Sweetwater 420 Fest with Yosh and Siliva!! Yosh and Sivlia...such a cute couple! It was a definitely both a busy and relaxing weekend here in ATL for the Sullivans! Friday night Ben and I spent a quiet evening cooking dinner in, snuggling on the couch and catching up on some DVR! I was exhausted from Jimmy Buffett the night before and wanted to spend some quality time with the hubby!! Saturday morning we were up bright and early! We headed downtown to the Sweetwater 420 Fest where we met up with Yosh and Silvia for the 5k race. After the race, We walked around the fest, ate lunch, drank beer, and hung out! We even played Trivia and Siliva won!!! Ben and I got home just in time to shower and change and head back downtown to the Highlands! There we met up with Chris and Melissa and Steph and Pat for dinner at El Taco! It was a lot of fun! Their chips, corn with lime mayo, and guacamole is to die for!!! Ben and I split a Mexican pizza which was not good at all...next time we go back we'll def get the fajitas. They looked delicious! After dinner we went to the movies to see "State of Play". It's the new movie with Russell Crowe, Ben Affleck (rar) and Rachel McAdams! It was an okay movie. Definitely not any oscar performances but still interesting concept! Sunday after a quick trip to the gym, Ben and I headed downtown to Six Feet Under which is a really cool bar with an amazing upstairs deck. They were hosting an Oyster Fest that weekend and some of Ben's coworkers had invited us to come down for it! After the Oyster Fest we came home and crashed!!! It was a perfect spring weekend! thanks for coming out to the race!! Happy bday Jay-Shmay, Mom, and Amanda!! !